This article contains excerpts from the forthcoming Joint Center for International Security Force Assistance (JCISFA) Assessment Handbook. Understanding the operational environment affects operational planning, but the mistake of a static understanding inhibits assessment of the plan’s impact on the environment. The important concept of how the plan (and the actions therein) affects the environment is demonstrated in the popular arcade game, Pac-Man. The constructs of the levels in Pac-Man represent a static, predictable environment (maze structure, pellets, tunnels, and bonuses). A player becomes familiar with these environments through iterative study (repeated game-play or simple online searches). Even a person who has never played the game (they do exist) can study the maps and develop an optimal strategy so that the pellets can be consumed in the fewest number of moves. A layer of complexity exists in the environment in the form of four ghosts (red, pink, blue, and orange). Inadequate assessment suggests that the movement of the ghosts is random, resulting in a simple “avoid” strategy. However, closer study reveals ghost behaviors that necessitate a new strategy. It turns out that the red ghost (Blinky) is programmed to actively pursue Pac-Man, but he is forbidden to chase Pac-Man up a blind alley. The other ghosts follow their own unique set of rules (see Figure 1) that are more or less based on Pac-Man’s movements. These rules can be recognized through iterations of play, or learned from various existing sources (mostly online). The point is that the player’s actions actually impact an element of the environment (ghosts). A rookie player would find it impossible to predict how all four ghosts will react to Pac-Man’s movements, but a working understanding of the operational environment (maze construct and ghosts) enables the player to be prepared for and to react when Pac-Man is in a bad position. Figure 1. The colored dots-squares indicate where the associated ghosts “want” to go based on Pac-Man’s position and direction. 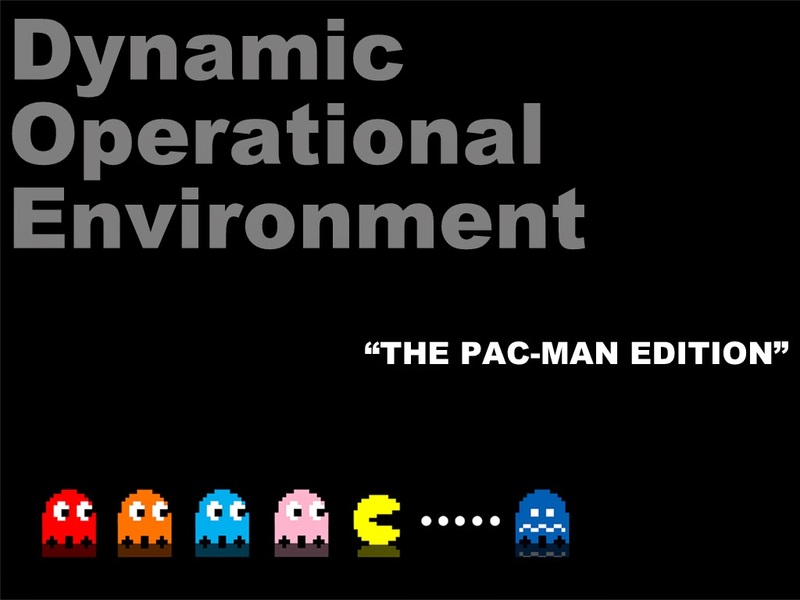 Familiarization with the aspects of the operational environment described in Figure 1, coupled with the knowledge that Blinky is forbidden to attack Pac-Man through a blind-alley, allows the player to know that Pac-Man is safe in his depicted location. Should the now-experienced player be thrust into a new-yet-operationally-similar environment (perhaps Ms. Pac-Man), he/she knows that reaching adequate understanding through proper assessment of this new mission and the factors therein will prepare him/her for success from the start. For instance, the behavior of the ghosts between the two games is not identical, but very similar. This is a simple example of applying theory-driven approaches to assessment to different (yet similar) operations. Theory driven assessment enables “holistic evaluation of operational progress,” testing possibly inappropriate assumptions that drive a strategy, reveals unexpected positive and negative effects, and allows for incremental improvement as assessment results inform future plans and continue to refine the very theory from which they are borne. The way forward for assessment includes a healthy mix of nontraditional, non-doctrinal, adaptive methods of analysis fused with traditional, hierarchical recommendation and decision-making processes. This, of course, is easier said than done. From a very high-level, birds-eye view, a commander must ask if assessment efforts are indeed attempting to understand the operational environment and the dynamics therein. Also, from the same perch, a commander must stress the need to ensure that measures of performance are analyzed and linked to measures of effectiveness via the aforementioned methods. The military advocates the need for understanding operational environments, so it makes sense that it should champion the use of theory-based assessment to achieve it. The challenge is to take advantage of current efforts to emphasize the need for specialized analysts. The military has exclusive access to academic departments at the Naval Postgraduate School (NPS), civilian universities, and various war colleges across the nation, and should use that access to cultivate theoretical assessment advances that can be incorporated into doctrine. The way ahead is to stress the need for an assessment process that demands more information about the operational environment in order to generate more options to deal with uncertainty and result in better resource management. Indicators of improvement must be effects-based with logical linkages to the assessed tasks. Williams, A. P., & Morris, C. J. (2009). “The Development of Theory-Driven Evaluation in the Military: Theory of the Front Line.” American Journal of Evaluation30 (62). Zvijac, D., J., (2013). “An Alternate Approach for Operational Assessment.” CNA.